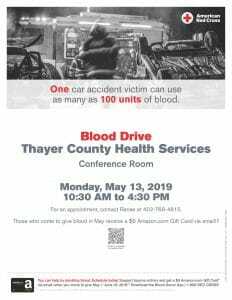 Thayer County Health Services. 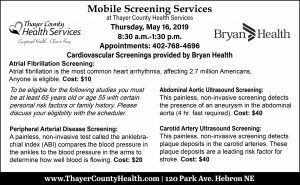 This Notice describes the privacy practices of TCHS (the “Hospital”) and all of its programs and departments, including its rural health clinics. The OHCA does not cover the information practices of practitioners in their private offices or at other practice locations. The following are the types of uses and disclosures we may make of your medical information without your permission. Where State or Federal law restricts one of the described uses or disclosures, we follow the requirements of such State or Federal law. These are general descriptions only. The do not cover every example of disclosure within a category. We will use and disclose your medical information for treatment. For example, we will share medical information about you with our nurses, your physicians and others who are involved in your care at the Hospital. We will also disclose your medical information about you to the nursing facility. We will use and disclose your medical information for payment purposes. For example, we will use your medical information to prepare your bill and we will send medical information to your insurance company with your bill. We may also disclose medical information about you to other medical care providers, medical plans and health care clearinghouses for their payment purposes. For example, if you are brought in by ambulance, the information collected will be given to the ambulance provider for its billing purposes. If State law requires, we will obtain your permission prior to disclosing to other providers or health insurance companies for payment purposes. We may use or disclose your medical information for our health care operations. For example, medical staff members or members of our workforce may review your medical information to evaluate the treatment and services provided, and the performance of our staff in care for you. In some cases, we will furnish other qualified parties with your medical information for their health care operations. The ambulance company, for example, may also want information on your condition to help them know whether they have done an effective job of providing care. If State law requires, we will obtain your permission prior to disclosing your medical information to other providers or health insurance companies for their health car e operations. We will disclose your medical information to our business associates and allow them to create, use and disclose your medical information to perform their services for us. For example, we may disclose your medical information to an outside billing company who assists us in billing insurance companies. We may contact you to provide information about treatment alternatives or other health-related benefits and services that may be of interest to you. We may contact you as part of a fundraising effort. We may also use, or disclose to a business associate or to a foundation related to the Hospital, certain medical information about you, such as your name, address, phone number, dates you received treatment or services, treating physician, outcome information and department of service (for example, cardiology or orthopedics), so that we or they may contact you to raise money for the Hospital. Any time you are contacted, whether in writing, by phone or by other means for our fundraising purposes, you will have the opportunity to “opt out” and not receive further fundraising communications related to the specific fundraising campaign or appeal for which you are being contacted, unless we have already sent a communication prior to receiving notice of our election to opt out. We may include your name, location in the facility6, general condition and religious affiliation, to other people who ask for you by name. We will not include your information in the facility directory if you object or we are prohibited by State or Federal law. We may disclose your location or general condition to a family member, your personal representative or another person identified by you. If any of these individuals are involved in your care or payment for care, we may also disclose such medical information as is directly relevant to their involvement. We will only release this information if you agree, are given the opportunity to object and do not, or if in our professional judgment, it would be in your best interest to allow the person to receive the information or act on your behalf. For example, we may allow a family member to pick up your prescriptions, medical supplies or x-rays. We may also disclose your information to an entity assisting in disaster relief efforts so that your family or individual responsible for your care may be notified of your location and condition. We will use and disclose your information as required by Federal, State or local law. To appropriate authorities authorized to receive reports of child abuse and neglect. With parent or guardian permission, to send proof of required immunization to a school. If you are involved in a lawsuit or a dispute, we may disclose medical information about you in response to a court or administrative order. We may also disclose medical information about you in response to a subpoena, discovery request or other lawful process by someone else involved in the dispute, but only if reasonable efforts have been made to notify you of the request or to obtain an order from the court protecting the information requested. As required by law, including reporting certain wounds and physical injuries. We are required to apply safeguards to protect your medical information for 50 years following your death. Following your death we may disclose medical information to a coroner, medical examiner or funeral director as necessary for them to carry out their duties and to a personal representative (for example, the executor of your estate). We may also release your medical information to a family member or other person who acted as personal representative or was involved in your care or payment for care before your death, if relevant to such person’s involvement, unless you have expressed a contrary preference. We may release medical information to organ, eye or tissue procurement, transplantation or banking organizations or entities as necessary to facilitate organ, eye or tissue donation and transplantation. Under certain circumstances, we may use or disclose your medical information for research, subject to certain safeguards. For example, we may disclose information to researchers when their research has been approved by a special committee that has reviewed the research proposal and established protocols to ensure the privacy of your medical information. We may disclose medical information about you to people preparing to conduct a research project, but the information will stay on site. Under certain circumstances, we may use or disclose your medical information to avert a serious threat to health and safety if we, in good faith, believe the use or disclosure is necessary to prevent or lessen the threat and is to a person reasonably able to prevent or lessen the threat (including the target) or is necessary for law enforcement authorities to identify or apprehend an individual involved in a crime. We may use and disclose your medical information for national security and intelligence activities authorized by law or for protective services of the President. If you are a military member, we may disclose to military authorities under certain circumstances. If you are an inmate of a correctional institution or under the custody of a law enforcement official, we may disclose to the institution, its agents or the law enforcement official your medical information necessary for health and the health and safety of other individuals. We may release medical information about you as authorized by law for workers’ compensation or similar programs that provide benefits for work-related injuries or illness. There are certain incidental uses or disclosures of your information that occur while we are providing service to you or conducting our business. For example, after surgery the nurse or doctor may need to use your name to identify family members that may be waiting for you in a waiting area. Other individuals waiting in the same area may hear your name called. We will make reasonable efforts to limit these incidental uses and disclosures. We may participate in one or more electronic health information exchanges which permits us to electronically exchange medical information about you with other participating providers (for example, doctors and hospitals) and health plans and their business associates. For example, we may permit a health plan that insures you to electronically access our records about you to verify a claim for payment for services we provide to you. Or, we may permit a physician providing care to you to electronically access our records in order to have up to date information with which to treat you. As described earlier in this Notice, participation in a health information exchange also lets us electronically access medical information from other participating providers and health plans for our treatment, payment and health care operations purposes as described in this Notice. We may in the future allow other parties, for example, public health departments that participate in the health information exchange, to access your medical information electronically for their permitted purposes as described in this Notice. Uses and Disclosures Not Described Above. We will obtain your authorization for any use of disclosure of your medical information that is not described in the preceding examples. Psychotherapy Notes. These are notes made by a mental health professional documenting conversations during private counseling sessions or in joint or group therapy. Many uses or disclosures of psychotherapy notes require your authorization. Marketing. We will not use or disclose your medical information for marketing purposes without your authorization. Moreover, if we will receive any financial remuneration from a third party in connection with marketing, we will tell you that in the authorization form. Sale of medical Information. We will not sell your medical information to third parties without your authorization. Any such authorization will state that we will receive remuneration in the transaction. If you provide authorization, you may revoke it at any time by giving us notice in accordance with our authorization policy and the instructions in our authorization form. Your revocation will not be effective for uses and disclosures made in reliance on your prior authorization. You have the right to request a restriction or limitation on the medical information we use or disclose about you for treatment, payment or health care operations or to persons involved in your care. We are not required to agree to your request, with one exception explained in the next paragraph, and we will notify you if we are unable to agree to your request. We are required to agree to your request that we not disclose certain health information to your health plan for payment or health care operations purposes, if you pay out-of-pocket in full for all expenses related to that service prior to your request, and the disclosure is not otherwise required by law. Such a restriction will only apply to records that relate solely to the service for which you have paid in full. If we later receive an Authorization from you dated after the date of your requested restriction which authorizes us to disclose all of your records to your health plan, we will assume you have withdrawn your request for restriction. Several different covered entities listed at the start of this Notice use this Notice. You must make a separate request to each covered entity from whom you will receive services that are involved in your request for any type of restriction. Contact the Hospital at the address listed below if you have any questions regarding which providers will be involved in your care. You may inspect and copy much of the medical information we maintain about you, with some exceptions. If we maintain the medical information electronically in one or more designated records sets and you ask for an electr4onic copy, we will provide the information to you in the form and format you request, if it is readily producible. If we cannot readily produce the record in the form and format you request, we will produce in in another readable electronic form we both agree to. We may charge a cost-based fee for producing copies or, if you request one, a summary. If you direct us to transmit your medical information to another person, we will do so, provided your signed, written direction clearly designates the recipient and location for delivery. You may request that we amend certain medical information that we keep in your records. We are not required to make all requested amendments, but will give each request careful consideration. If we deny your request, we will provide you with a written explanation of the reasons and your rights. You may have the right to receive an accounting of certain disclosures of your medical information made by use or our business associates for the six years prior to your request. Your right to an accounting does not include disclosures for treatment, payment and health care operations and certain other types of disclosures, for example, as part of a facility directory or disclosures in accordance with your authorization. You may request that we communicate with you about your medical information in a certain way or at a certain location. We must agree to your request if it is reasonable and specifies the alternative means or location. We are required by law to notify you of a breach of your unsecured medical information. We will provide such notification to you without unreasonable delay but in no case later than 60 days after we discover the breach. All requests to exercise these rights must be in writing. We will respond to your request on a timely basis in accordance with our written policies and as required by law. 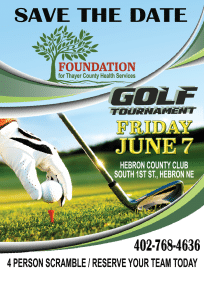 Contact the Privacy Officer at 402-768-4627 for more information or to obtain request forms. We are required to follow the terms of the Notice currently in effect. We reserve the right to change our practices and the terms of this Notice and to make the new practices and notice provisions effective for all medical information that we maintain. Before we make such changes effective, we will make available the revised Notice by posting it, where copies will also be available. 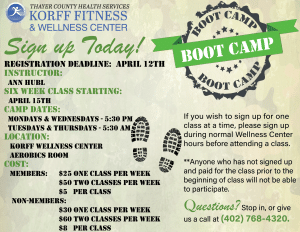 The revised Notice will also be posted on our website at www.thayercountyhealth.com. You are entitled to receive this Notice in written form. Please contact the Privacy Officer at the address listed below to obtain a written copy. If you have concerns about any of our privacy practices or believe that your privacy rights have been violated, you may file a complaint with the Hospital using the contact information at the end of this Notice. You may also submit a written complaint to the U.S. Department of Health and Human Services. There will be no retaliation for filing a complaint.